Introducing self-service kiosks in your QSR has many benefits including, order accuracy, improving staff efficiency and more. But, there are some deeper questions to consider that can shape your business case and priority for self-service ordering in your restaurant. But first, ask yourself, why have self-service kiosks thrived? Customer Expectations: Customers today expect to have an easy, fast and unique experience when they interact with any self-service solution. That’s why ATMs, pay-at-the-pump fueling and self-check-ins at airports have performed well and continue to be instrumental in how customers withdraw cash, fuel their cars and check-in to flights. Business Growth: A recent whitepaper and an article discussed how average ticket item is likely to increase for any QSRs using self-service ordering kiosks by 15-30 percent. 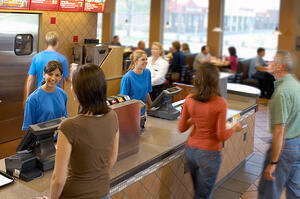 What is the average throughput during your busiest times at your restaurant? This question is about how efficiently your business serves your customers at the busiest time of the day. Whether you are already at capacity or you need to reallocate resources, ask yourself or restaurant owners to learn more about the existing inefficiencies in the business. Is order accuracy a problem? Order accuracy is an important part of customer experience. If your cashier doesn’t enter the order correctly, customers won’t get what they want for their meals. Your staff then needs to spend more time preparing the correct order while the incorrect one gets thrown out creating food waste. This can leave customers unsatisfied and they may not return to the establishment. Has your restaurant seen a negative trend or static growth? Have you been able to scale? You also need to be aware when your restaurant’s growth has become stagnant or is trending to go down. This is when you need new strategies to help boost your business and get customers in again and again. Research shows how implementing a kiosk strategy in QSRs can help raise average ticket price by 30 percent. How familiar are your customers with your menu? How well do new menu items work? This question is aimed to understand how familiar you think your customers are with your restaurant menu. Ask yourself or restaurant owners if you can customize your menus for the time of day or for a different season to be able to push specific menu items to customers. What is your customer retention like? Customer retention at the center of any successful business. If your business cannot retain existing customers for any reason, you need to rethink your strategies. This question helps explore if your restaurant business is implementing any loyalty programs to gain additional new customer and retain old ones. What steps have you taken to integrate different channels to enhance customers' ordering experience? Your customers are changing and becoming more tech savvy. As they start getting a multi-channel experience from a retail store they visit, they may start expecting the same from your restaurant business. This question aims to learn if you have taken any steps to improve your customers’ food ordering process. The self-service trend is picking up momentum and growing across all businesses, particularly in the QSR space. These questions can help restaurants owners learn about their business and ascertain if investing in a self-service kiosk strategy is the best for them. A self-service kiosk may or may not be the right choice for your business, but drop us a line and let’s figure this out together.